A classic turkey dinner is a great way to share a Thanksgiving meal with family and friends but this year we invite you to add a little global flair to your table with our diverse cookbook collection! The Library has a wide variety of cookbooks featuring recipes from here in the United States to all over the world from Egypt to New Zealand. Start close to home with classic Americana in Eating with Uncle Sam: Recipes and Historical Bites from the National Archives. Then cross the Atlantic with Swedish Food: 200 Selected Swedish Dishes, head east to Turkey with Turkey: More than 100 Recipes with Tales from the Road, and continue your journey to the Pacific with The Cooking of Indonesia and the Philippines. This is just a small sampling, find these and so many more cookbooks from around the world on the 5th Floor of Lauinger Library! The Library also has a great collection of cooking magazines available through Press Reader. Just look for “"Food & Drinks"” under the publication categories to find great titles like Delicious, Cocina Vegetariana, and BBC’s Good Food. 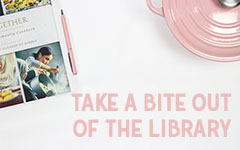 Whether you are preparing your menu for the upcoming holiday or just looking for something new to shake up your weeknight dinner routine, the Library has what you need! Bon Appétit!